Do you have a Facebook Gold Membership? The process for getting one is pretty simple and soon your friends will be asking for details on how they can become Facebook Gold Members. Take the photo above and save it to your computer. Upload it to your Facebook account. Make it your profile photo. 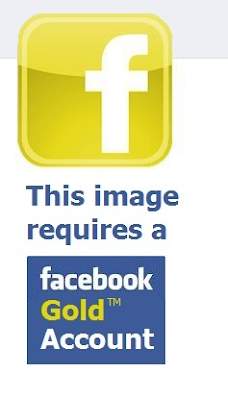 Now add an Status Update that suggests, "I've just signed up for a Facebook Gold Membership! They have a "Dislike" button for Gold Members!" Ta da! You are now a Gold Member. "Status Update visible to Gold Account Members only." "Gold Account beta update in progress. Please be patient!" "Automatic Reply: This service unavailable for non-Gold members." Even better, take that photo and make 20 copies and upload it as an album. Then start tagging your friends in random places in the photo. When they go to look at the photo, they will think they are missing out on something. HolyJaun, this is my first comment on your site. And, might I say - this is awesome. I could swear I've seen something exactly like this on 4chan for a long, long time now. You probably have. 4chan is usually 4 - 6 weeks out on anything Reddit does which is two days ahead of Digg which is 3 months ahead of the common consumer. I found it on Reddit, but apologies to 4chan and kudos to the creator. For added fun: Download the Stylish addon for firefox and install a user styles theme for facebook from userstyles.org and show of your "gold account theme". 1. Think of something original instead of copying something from 2007. Sorry if you are trying to trick your friends and they use the internet to see one of the 34,000 links that come up Facebook Gold. Has anyone noticed that if you click on the "comments" on one of these Facebook Gold "fan" pages, it brings up a link to a quiz titled "How DUMB are YOU?"???? Help keep this content free. Please take one minute to complete a SPAM-free market research survey to gain access to this special content. Are you sure you want to leave? I have a screen shot of the quiz also... not sure how to post it.. Send it to me: holyjuan@gmail.com I'll post it. Wow Its really Funny. Going to try this out.